The “woven” mind of master Gavin Greenaway. His work as a conductor has covered all of the major Hollywood blockbusters including “Interstellar” or “The Hunger Games”. Today the Emmy award winning composer and pianist released his second solo album. In this podcast Gavin speaks about the album, music, life, and his individual approach to piano composition. In this 90-minute conversation, we gain a detailed overview of Gavin’s musical journey to date, including his early days in London co-founding the commercial house, Independently Thinking Music, with his fellow Trinity College of Music graduate, John Powell, and how together they forged a path to Hollywood. Gavin talks us through his creative process, and the positive aspects of self-releasing an album in the age of streaming. If there’s one thing Disney’s theme parks are famous for more than cuddly characters and roller coasters it’s fireworks shows. Disney’s spectacular displays often feature fireworks which explode into elaborate shapes in time with projections onto the monuments in the middle of the park. They aren’t just there for show. The fireworks displays usually take place just before the parks close so act as an incentive for guests to stay right until the end of the day. The longer they stay, the more they spend on food, drink and merchandise which boosts both revenue and profits as the margins on them help to offset the huge overheads of running the parks. It puts a sparkle on the results of Disney’s parks and resorts division.In the year to 30 September 2017 its profits were up 14.4% on the previous year to $3.8 billion on revenue of $18.4 billion. It is higher than that of any other division of the Walt Disney Company except for its media networks. That’s just the start. The science to the fireworks shows stretches far beyond keeping guests in the parks till closing. The more spectacular the display, the greater the likelihood that guests will return, especially since every show is bespoke to each park. They aren’t displays that can be seen anywhere else and that makes them even more memorable. Music is the magic touch. The fireworks in Disney’s displays are carefully choreographed to stirring soundtracks which are usually lifted from classic cartoons. There is one exception.The sprawling Disney World complex in Orlando, Florida comprises two water parks and four theme parks. Perhaps the most unusual is the futuristic Epcot which celebrates its 35th anniversary this year. Epcot is split into two sections. One half has attractions themed to science and technology and is famous for the giant golf ball-like geodesic dome at its centre. Known as Spaceship Earth, the 180-feet silver structure houses a ride which moves past scenes showing the history of telecommunications. There’s also a space-themed simulator set inside a giant centrifuge which is used to recreate the G-Forces felt when a rocket takes-off. These attractions cleverly mix education and entertainment which is an Epcot hallmark. The other half of the park features mock-ups of 11 countries in pavilions located around a huge lagoon. Locals work in the shops there which stock traditional produce whilst regional dishes are on offer in the restaurants. It is like a permanent World’s Fair and this theme carries over to Epcot’s nightly son et Lumière on the lagoon. 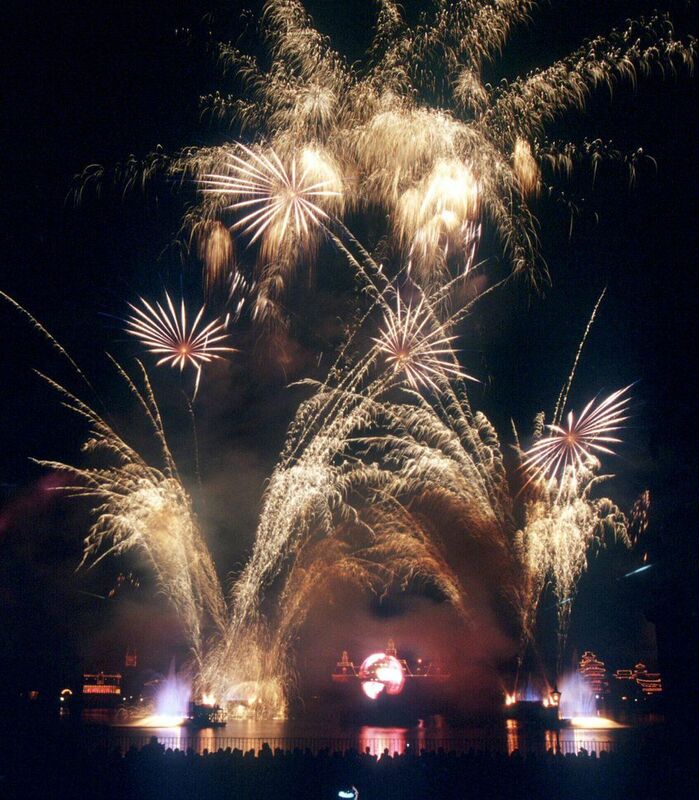 Instead of being themed to fairytales or films like its counterparts in other Disney parks, the globe is at the heart of Illuminations: Reflections of Earth. Literally. The show was launched in 1999 amidst the optimism of increased global co-operation that the Millennium was expected to usher in. As the lights go down around the lagoon it begins in dramatic fashion as fireballs are launched from a huge barge whilst fireworks suddenly explode above. It symbolises the creation of the world and that soon floats into view. The show’s party trick is a globe which is three stories high and 28-feet wide. It was the world’s first spherical Light Emitting Diode (LED) video screen and is controlled by 67 computers in 40 locations.It is wrapped in more than 180,000 LED pixels which are arranged to form the shape of countries on the globe. They display an inspiring arrangement of scenes starting with cave drawings at the birth of civilisation right up to the journey of the Olympic Flame. Martin Luther King, Mother Teresa, Muhammad Ali and the Dalai Lama all make appearances as the globe rotates. At the same time floating fountains dance around it, lasers fire from the surrounding pavilions and a total of 2,800 fireworks launch from 34 locations around the lagoon. The finale sees the globe open up like a lotus flower to reveal a giant flaming torch which rises 40 feet into the air as lanterns light up the lagoon and tiny white fireworks crackle in the sky. It is an emotional tour-de-force with so much going on that it’s not possible to catch it all even after multiple viewings. There are subtle details, like fairy lights lining the surrounding buildings flashing in time to the action, and more obvious touches such as the images on the globe changing as it spins giving a different view to guests watching around the lagoon. However, as stunning as the spectacle is, it is the music which leaves the most lasting impression. At the heart of Reflections of Earth is a screen which curves around a three storey-high globe and is controlled by 67 computers in 40 locations The 13 minute score to Reflections of Earth is widely considered to be one of the most memorable fireworks scores ever written. Indeed, it has been played during presidential inaugurations, the Superbowl Half Time Show and even won an Emmy when it was used in the Millennium coverage broadcast by Disney’s ABC network. Classically-inspired the theme moves from quiet moments, focused on individual instruments, to rousing crescendos timed to the launch of fireballs and fireworks. It wouldn’t sound out of place in a Hollywood blockbuster and there is good reason for this. The score was written by British composer Gavin Greenaway whose résumé reads like a roll call of the most well-known movies in history. He has recently conducted the scores for Dunkirk and September’s smash hit Kingsman: The Golden Circle. In the past five years alone Greenaway has worked on Captain America: Civil War, Terminator Genisys, Interstellar, Ender’s Game, Fast & Furious 6, The Dark Knight Rises and The Hunger Games. Although he is usually found conducting classical orchestras for movie scores, Reflections of Earth showed that composing is really where his talent lies. It wasn’t the work of a moment. “It didn’t just happen. It took a lot of iterations going over and just finding a way to make it work.” Greenaway told Forbes. Indeed, hr says that he even laboured over individual notes. At the end of the show there are three chords and I did that about five times with different versions.” He adds that, from start to finish, “I think I probably worked on it for about three months, not continuously but there were six weeks at the beginning before I played Disney a single note. I had already written huge parts of it, I just didn’t want to play it to them. “Whenever I’m working, once the deal has been made I put the money and the time to one side and it’s just my struggle to get the music to happen no matter how long it takes. I’ll give it my full attention and that’s just the way my brain works. Greenaway had surprisingly little to work with and he says this allowed his creativity to run free. At the outset he met legendary Disney show director Don Dorsey who had drawn storyboards for key moments in the show. Greenaway says he started by experimenting on the piano and refined it over time. “I would tap away on the piano, leave it for a few hours, go for a run or a drive and then come back to it. For me, anything good I have ever written has been the result of polishing. You come up with an idea that is OK and you hone it. He says that the fireworks were created to fit the music once it had been finalised. “Until that point there was lots of leeway. We could make it 10 seconds shorter or longer. At various times it was different lengths.” In contrast, there is far less flexibility when writing music for films as the structure, sentiment and timing of each scene is carefully controlled by the director. Since then Zimmer has composed music for more than 150 movies including the Lion King, Gladiator and the Pirates of the Caribbean series. Zimmer’s work is notable for mixing traditional orchestral arrangements with electronic music sounds and this interest began at an early age. Greenaway says that he too was interested in music technology. “So along the way I got to meet Hans and he showed me how to do programming and taught me some basics. We ended up with the same agent and Hans was writing a Colgate commercial when he got a call to go to America, for Rain Man I think, so I finished it off. Greenaway says he had been a fan of Disney’s parks since visiting Orlando in his youth and it gave him valuable insight. He says he “was very careful with Reflections not to have any sound that was overtly synthetic because it would date very quickly. “One of the briefs was that it has to be bold and survive the environment. You’re around a lagoon, you’ve got fireworks going off and people talking. Subtlety is not going to work. It has to be robust so I had probably four times as many cymbals as I would usually have in a piece. Greenaway says that the final track was recorded at the renowned Abbey Road Studios in London and was then mixed in Epcot itself. 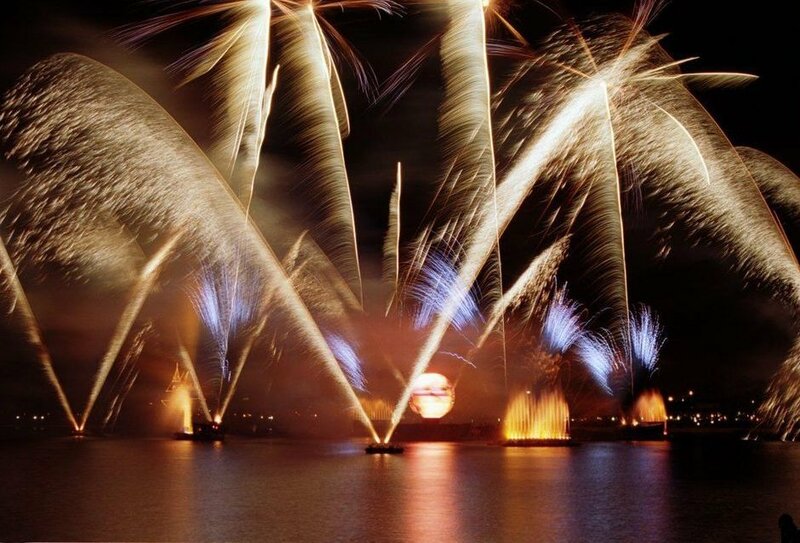 Unlike movie music, which is played on many different types of sound system, Reflections of Earth was only designed to be heard on the speakers hidden around the lagoon in Epcot so Greenaway had to ensure that it sounds best on them. “The park closes at nine so we went in and worked for seven or eight hours over a number of nights to install it. “The end result is what I hoped it would be but I was very nervous. I was pretty much set up to fail. I had never done night-time spectaculars before but everything came together. The chance to write music from scratch, a great director, great fireworks, great design, fantastic idea. It ticked every box. I didn’t know if I could do it or not but the more I did, the more I enjoyed it. They were proved right as the CD accelerated to the top of the local charts the day after release. “I knew at that point that we had made something special,” says Greenaway. Despite being at the heart of Epcot for more than half of the park’s lifetime, the sun appears to be setting on Reflections of Earth. Disney is embarking on an overhaul of Epcot with initial concept art showing a series of sweeping fountains on the lagoon and what appears to be a giant curved LED screen. It seems purpose-built for a new show and Greenaway says that neither he nor Dorsey are involved with it. His stirring score will live on regardless as anyone landing at an airport in the United States will hear Reflections of Earth playing in the international arrivals hall. Greenaway says it still inspires him. It paid off as Greenaway says he got work writing the music for the 2010 Winter Olympics cauldron lighting ceremony after the Musical Director of the event saw Reflections of Earth. It was accompanied by an equally rousing piece called ‘Peaks of Endeavour’ which was designed to motivate the athletes in the grand tradition of Olympic anthems. It is the spiritual successor to Reflections of Earth and, remarkably Greenaway says it only took him three or four days to write. “Occasionally you can do that but it doesn’t often happen,” he stresses. Then last year, he returned to writing duties with the release of “Il Falco Bianco”, a set of soothing and highly respected piano tracks. Testimony to the timelessness of his work, it is still going strong. “I got 100,000 individual streams last month on Apple and Spotify,” he says adding that he is putting the finishing touches to a follow-up. “With the first album I was trying to be fairly classical and not do anything too outrageous but this next one is going to take me a while to edit because I’ve done lots of layering of the piano, making different noises with it and instead of recording on a grand piano I’ve actually recorded on an upright. The reason being that it is very easy to put felt between the hammers on an upright so I’ve put in different materials and it changes the sound. “It is a bit more pop-sounding than the last one and hopefully a bit more accessible. I’m finding that the tracks that are getting listened to on Apple and Spotify tend to be the more straightforward ones so I need to build up my fans before I can say ‘now listen to this track which is more outrageous.”Greenaway says that the rest of his time is largely taken up with conducting. On 30 September he stepped into the history books by conducting Casino Royale, the first ever James Bond movie screened with a score played by a live orchestra. “I’m doing it again next year then I’m doing a series of eight concerts for Hans Zimmer, orchestral ones, and a couple of concerts for John Powell in Hamburg.” He adds that conducting perfectly complements his solo music writing as it is concentrated into short, fixed amounts of time. “In conducting other composers’ work you have to hang your ego at the door. You need an awful lot of musical knowledge to do it well. You need to be very good at dealing with pressure under fire because you’ve got questions coming at you from 90 musicians, you’ve got the director talking to the composer who is telling you changes to make, and a limited amount of time to get the recording made.“You’ve got multiple conversations, multiple points of view, and you’ve got to keep the musicians and the composer happy and calm. There’s an awful lot of skills involved, which I love, but at the end of the day you go home.” It’s a fitting role as tens of millions of Epcot visitors have done just that with Greenaway’s music fresh in their minds.